The holidays are fast approaching, and your to-do list probably consists of shopping and preparations for holiday parties, along with the usual work and family commitments. Last-minute tax planning might seem like something you do in February, March or April — but it should jump to the top of your list in December. By the time you’re filing, it’s too late to maximize your tax savings. Doing a tax checkup doesn’t need to take much time, and it could free up money for your holiday shopping budget. First, review your tax withholding or payments. This isn’t an issue if most of your income comes from W-2 wages, but it might be if you’re self-employed, have a part-time job or have dividend or interest income. If you don’t send Uncle Sam — and his buddy, the state — enough money throughout the year, you could be charged about 3% interest on the amount you should have paid. That might not seem like much, but it’s an expense you can avoid with a few minutes of planning. Paid at least 90% of this year’s tax liability. Paid 100% of last year’s tax liability (110% if you make more than $75,000 if you’re married and filing separately, or more than $150,000 if you use any other filing status). Owe less than $1,000 on your 2016 return. You’ll find last year’s tax liability on line 63 on your 2015 IRS Form 1040. If you haven’t paid at least that much this year through W-2 withholdings or estimated payments, submit an estimated payment for the fourth quarter by January 17, 2017. If you made less this year than you did last year, run a mock return to see if you’ve paid at least 90% of this year’s liability. If you haven’t fully funded your company retirement plan — 401(k), 403(b), 457, etc. — this is your last chance. You can defer $18,000 in 2016 and make a catch-up contribution of up to $6,000 if you’re age 50 or older. Contributions are pre-tax, so every dollar you save lowers your taxable income. Your contributions must come from payroll deductions, so to max them out, you might need to funnel as much of your last two paychecks as you can handle into the account. You can also fund these with a year-end bonus. Ask your human resources specialist about your options. Health savings accounts are a favorite tool of financial planners, as they’re the only true tax-free vehicles. You can deduct contributions, and any gains are tax free if you withdraw them to pay qualified medical expenses. If you have a health plan that’s eligible for an HSA, you can contribute up to $3,350 in 2016 if you’re a single tax filer and up to $6,750 if you have a family. If you’re 50 and older, you can make a $1,000 catch-up contribution. And unlike a 401(k), you don’t need to fund an HSA through a payroll deduction — you can write a check. HSA balances carry over indefinitely. If you’re a few years from retirement, use your HSA contributions to lower your taxes and build up a healthy nest egg you can use to pay medical bills in years to come. This sounds like a sophisticated strategy, but tax-loss harvesting just means selling losing financial positions — including stocks, bonds, mutual funds and exchange-traded funds — in order to qualify for a tax deduction. The IRS allows you to deduct $3,000 of capital losses every year. Beware of triggering the wash sale rules. These stipulate that if you take a loss on the sale of a financial position, then invest in the same or a similar holding within 30 days, you’ll effectively forfeit the tax loss. This is an excellent time to give to a charity. And if you donate to your area’s community foundation — an entity that supports nonprofits in a given area — you might get an extra tax credit beyond the federal deduction. Every state has these community foundations, and some offer taxpayers a 50% tax credit for their donations, which is a dollar-for-dollar reduction of your state taxes. That’s much better than a deduction. Others cap the credit at 25%. The IRS allows taxpayers to deduct medical expenses that exceed 10% of their adjusted gross income. Those expenses can include medical mileage — trips to doctors or to the pharmacy to fill prescriptions, etc. — and tolls and co-pays. You can also surpass the threshold by grouping expenses into one year. For instance, if you had a larger than usual amount of medical expenses in 2016, consider scheduling a dental procedure before year-end to ensure you can deduct it. Taking a few minutes to review your tax situation could save you hundreds, or even thousands, of dollars when you file your return. Here is a webinar where I talk about how to escape low-yield bank savings options. There’s no doubt that the returns you can find on cash holdings these days are less than attractive. Traditional bank savings vehicles — such as checking accounts, savings accounts, money market deposit accounts and certificates of deposit — often yield less than 1% per year. Longer-term CDs — say, three years — occasionally yield closer to 1.5%. You don’t have to accept those paltry rates. There are some ways you may be able to get better returns without taking on too much additional risk. About Kirk Kinder: Kirk Kinder, CFP® (Certified Financial Planner) is the founder and President of Picket Fence Financial. Kirk worked for the Motley Fool where he served as their Director of Member Services. The Fool’s approach of exposing Wall Street’s dirty secrets appealed to Kirk. They shared a common belief that financial planners entrusted with other’s money should have their client’s interests at heart. After leaving the Fool, Kirk worked at a fee-only financial planning firm in Palm Harbor, Florida. There Kirk finished his studies for the Certified Financial Planner designation. Kirk then started Picket Fence Financial with offices in the Baltimore/DC area and Tampa/Clearwater, Florida vicinity. Kirk also has a Masters degree in Personal Financial Planning from the College for Financial Planning – the organization that manages the education requirement for the CFP. Kirk has been quoted in several financial publications including the Wall Street Journal, Kiplingers, Investor’s Business Daily, Standard and Poor’s, and Bloomberg Wealth Manager to name a few. Kirk has also been featured on the local Fox, ABC and NBC affiliates in Baltimore and Tampa Bay. Here is a webinar where I discuss about how a defined benefit plan can benefit small business owners, independent contractors, consultants, and specialists. It is a unique strategy that saves thousands in taxes and allows folks to build their retirement savings faster than the usual defined contribution plans. Here is a webinar where I talk about how to get off the paycheck to paycheck hamster wheel and start to take control of your spending and financial life. It doesn’t take massive action. It takes many small steps that add into miles over time. Here is a webinar where I talk about the recent market volatility and what may lie in store for the markets for the rest of the year. Here is a webinar where I talk about the recent legal changes to the Social Security system. Two key benefit techniques were eliminated by Congress: the file and suspend strategy and restricted application. I discuss how these strategies helped clients as well as who can still use them. Here is a webinar where I talk about the recent market downturn and presented a bullish and bearish case for the markets. Bel Air, MD – Mark your calendars for the 17th of October when Picket Fence Tax Service will host a Family Festival in Bel Air from 9am to noon. Kids will enjoy this free event that includes face painting, corn hole, moon bounce and food for everyone. The festival will be held at the Bel Air Town Center at the corner of the Baltimore Pike and Kelly Avenue, near Chili’s and the new Alchemy Elements restaurant. Gates to the fest will be open at 9:00 AM and the fun will last until 12:00 PM. Kirk Kinder started a fee-only financial planning firm back in 2006, with the motto of ‘Saving folks from Wall Street’. Soon after Picket Fence Financial opened and took on local clients, Kinder discovered that there are a lot of people who were not happy with the preparation of their income tax. Kinder had already worked with several tax franchises in the past, so he has been preparing his client’s taxes for many years now. That was the impetus for opening the stand-alone storefront income tax service that is now Picket Fence Tax. Sponsoring this fun-filled free event is the firm’s way to give thanks to the community for its continued trust and patronage to Picket Fence Tax Service. For more information about the Family Fest, you may contact Kirk Kinder at 443-356-4520 or you may email him at kirk@picketfencetax.com. 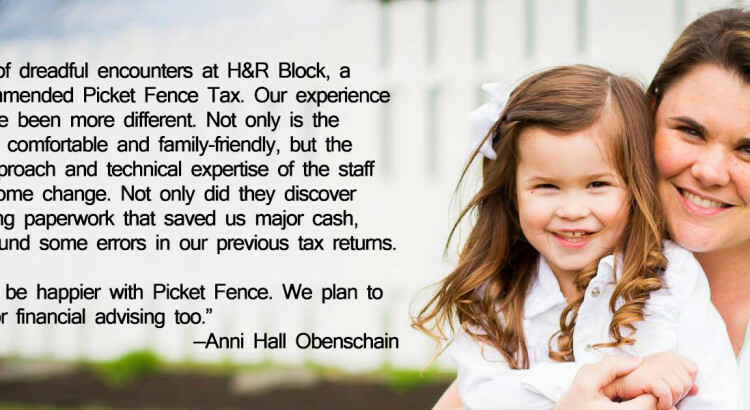 Picket Fence Tax Service, based in Bel Air MD, aims to transform the tax preparation industry by providing customers a unique, stress free experience at an excellent price. With its coffee shop feel, customers can get their favorite beverage and pastry while they sit in comfortable chairs and couches with Wi-Fi access. Please visit www.picketfencetax.com. Here is a webinar where I discussed about reverse mortgages with Sue Haviland. What is a reverse mortgage? How are they typically used? Why they are not a tool of last resort.